Despite volumes of self-help books on the market, there is no manual that can truly prepare you for the roller coaster ride of parenting. And nothing can insulate you when your child disappoints. You face an additional array of challenges when your child is gifted, frequently weathered alone, since friends and extended family often don't understand why the heck you are worried. After all, your child is talented, quick as a whip, and is presumed to have innate advantages. Most don't realize that this path is often rocky, circuitous and overwhelming, filled with false starts, disappointments and fears. Sometimes your gifted child won't, or can't, or is oblivious to, or lacks the skills for, or is "morally opposed" to fitting in with peers. He might be great with younger kids and adults. She may complain about boredom with same-age peers, who can't converse at the same level. He might have given up on kids who don't share his interests or understand him. Events with extended family, field trips, and even play time with neighborhood children can descend into misunderstanding, arguments, and tears. Introversion, asynchronous development, heightened sensitivity, and overthinking are just a few of the common threads that affect gifted peer relations. So, instead of fitting in, your child isolates, or sounds condescending, or appears shy, or seems immature. This complicates every interaction outside of home - from the classroom to summer activities. You question whether he is mature enough to try an extracurricular he longs to join, since he might lack the skills to navigate the social scene. And your heart breaks for her when she is excluded from birthday parties or sits home alone on prom night. Perhaps your gifted child underachieves. She procrastinates, lacks planning and study skills, only cares about topics that interest her, or has lost respect for the school and her teachers. She may be torn between multiple interests, delves into only those topics that fascinate her, and refuses to invest effort into the tedious and demanding work required for college admission - or that would challenge her abilities. 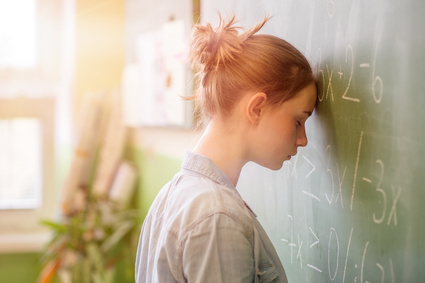 Your child might be a stealth underachiever... aka, an underachiever under-the radar. Although seemingly successful at school, both you and your child are quite aware that he slacks off, cuts corners, and is not pushing himself. Yet, he performs well enough to achieve outward markers of success, so teachers leave him alone and accept his lackluster effort. You wonder how he will manage when eventually faced with truly demanding, challenging work, and grieve over wasted potential, lost years, and how much his teachers have underestimated him. Gifted children can create quite a scene. Meltdowns in stores, at family gatherings, or movie theaters due to perceived unfairness, expectations to socialize (just this once!) or a lone scratchy collar tag (where are scissors when you need them!) can wear you down. Sometimes the embarrassment stems from our own expectations. We want our child to be "normal." We adore his talents, passion and even his quirkiness. But the asynchrony, hyper-focus and rigidity can seem like too much at times. So when the other middle school kids show interest in their appearance and social trends, we worry about the lag in her development, and resent that we must beg her to take a shower. When he builds elaborate sand castles while the other kids play beach volleyball, we wish he would - could - relate and decide to join in. Other times, we question our parenting acumen. After all, if she's so smart, how can she not know...(fill in the blank)? How can such a sensitive child rudely tell his teacher she's "not well informed" about politics? After all the talks about manners, why won't she put the book down and respond politely when the nice sales clerk talks to her? And why can't I motivate him to complete homework assignments on time? As parents, we often blame ourselves when our child responds to his own inner compass, and believe that somehow we have failed. Many times, disappointment is triggered by outside circumstance, unrelated to your child's behavior. Schools that fail to deliver. Family and friends who misunderstand your child's asynchronous development, or criticize the gifted label ("all children are gifted in their own way...so stop bragging"). Missed opportunities due to homeschooling or cyberschooling, since high school sports teams, marching band or even school dances may be off-limits or just too complicated to join. Even grade or subject acceleration has drawbacks when a child does not quite blend in with peers, or misses out on some of his grade's activities. Fitting square pegs into round holes requires compromise, frequent adjustments and sometimes, results in disappointment. There is no easy-to-follow directive that will ease the sting of disappoint. And I am not going to offer simplistic self-help "remedies" that may fall flat and minimize your experience. Accepting, accommodating, managing, and even embracing the ups and down draws upon all of your strengths. Only YOU know what works best for you and your family. But you can gain support and increased understanding through learning as much as possible about giftedness, child development, gifted education, and parenting skills. Seek support from friends and family who understand, teachers you respect, local and state-based gifted advocacy groups, and online forums, such as Hoagie's Gifted, GHF, and Davidson's. Support will help you cope, and also help you to keep your feelings separate from your child. And if you feel burdened by sadness and frustration, consider counseling with a licensed mental health professional who can help you move beyond the shadow of disappointment. This blog post was part of GHF's blog hop on Myths, Misconceptions and Misunderstandings about Giftedness.